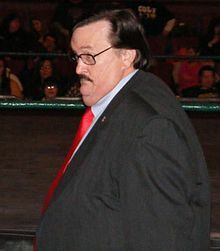 William Alvin "Bill" Moody (March 10, 1954 - March 5, 2013) better known by his ring name Paul Bearer as well as Percival Pringle III, was an American professional wrestling manager and professional wrestler. He was best known for managing both The Undertaker as well as his on-screen brother, Kane in the WWF/WWE. Moody was born on April 10, 1954 in Mobile, Alabama. He died on March 5, 2013 in Mobile, Alabama from a heart attack. Club board member of Cauliflower Alley Club "Cowboy" Bob Kelly said that during a reunion on March 2, Moody was having trouble breathing and was also coughing. Moody said that he was going to be treated for respiratory problems and Kelly said that Moody was treated for a blood clot after the reunion. ↑ "Paul Bearer passes away". WWE. Retrieved 2013-01-05. ↑ "Paul Bearer cause of death--heart attack". TMZ. 24 March 2013. Retrieved 25 March 2013. This page was last changed on 11 September 2018, at 15:13.